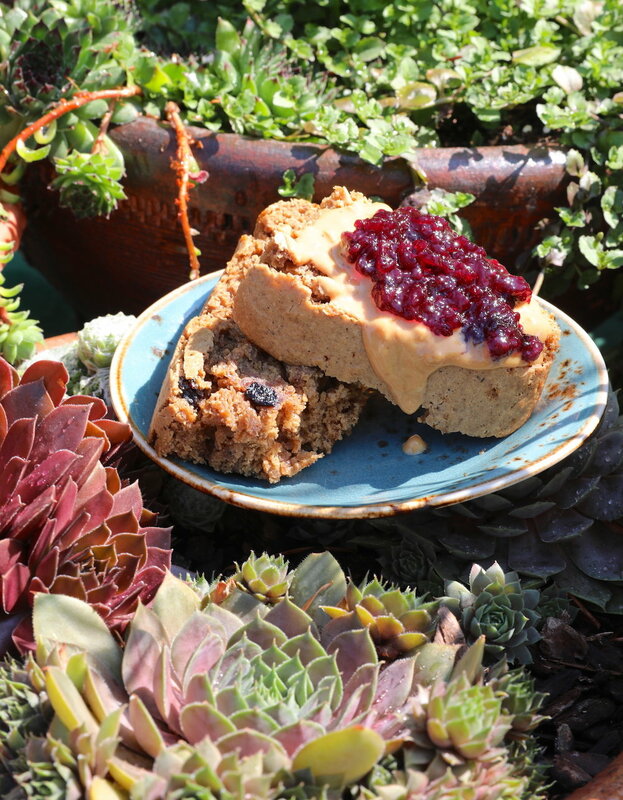 This peanut butter bread loaf is refined sugar free, sweetened with maple syrup and coconut sugar, and it contains no oil. While it's not a health food, it's a really fun and easy recipe, it travels well, and makes a great treat to share with others. Peanut butter and jelly bread has been getting us through some strenuous days of manual labor out on our new property clearing a few invasive blackberry bushes. After six months of searching for land to purchase and build our first home, we finally closed on a 7 acre parcel of forest here in Washington state. It's a beautiful property covered with ferns and pine trees and we think it will be just the right place to build our small cabin and learn how to grow our own food. For now, we've been practicing with a few potted plants around our Airstream and seeing what we can learn about the process. We mostly have flowers and succulents along with a tomato plant that has five green tomatoes ripening currently. This peanut butter and jelly bread is so easy to make, all you need is two bowls and a 9 x 9 inch baking pan or loaf pan. Most of the ingredients are common household items and require very little preparation other than mixing and dumping into a pan. If you make this now, in less than an hour you'll have a delicious fresh sliced bread to enjoy all week! The addition of the dried blueberries adds a fruity jelly flavor, but feel free to omit for plain peanut butter bread. For other variations, try adding chopped nuts, raisins, or vegan chocolate chips. Dial down on the coconut sugar for sandwich bread or add more coconut sugar for a sweeter loaf. Slice and store in the fridge covered for up to one week.